Patrick "Pat" Floyd Garrett (June 5, 1850 – February 29, 1908) was an Old West lawman, rancher and barkeep, and a frequent and celebrated target or figurehead of glorious, glorious historical revisionism. He is best known for his brutal murder/just and lawful execution of working class hero/heinous outlaw Billy the Kid. The rest of it is a bit of a mystery, really. For those without comedic tastes, the so-called experts at Wikipedia have an article about Pat Garrett. Garrett was raised a strict Mormon by his eight fathers and forty-four mothers in a Auschiwtz-Birkenau-style campus on the outskirts of Cusseta, Alabama. His childhood was scarred by repeated brutalising at the hands of drunkard patriarch Frère Garrett, a fundamentalist cult leader who ruled through screaming, fear of violence, and whiskey rationing. Several accounts state that the younger Garrett suffered such physical trauma as light smacking on the back of the hand, gentle admonishing on the buttocks with reeds, and grazed knees because his irresponsible parents allowed him to climb trees unsupervised. Garrett's mother Edina later claimed that she wished her son could have been aborted to be spared a childhood of abuse; unfortunately this would have required parental notification because of her tender age. 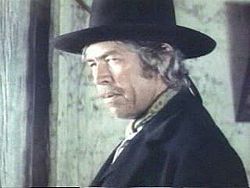 Pat Garrett probably looked a lot like mid-70s James Coburn. It was often said that his face could have been "used as a pesticide". Desperate to escape his unhappy childhood, and the Garrett family tradition of marriage between siblings, Pat Garrett left home at the age of 19 for free-living frontier state New Mexico, a place where long-standing liberal freedoms allowed peoples of all races and creeds to happily co-exist. While working on a ranch with buffalo extinction enthusiast W. Farquar Evilton, Garrett met and married his first wife, Juanita. Unfortunately, Juanita died a tortuous death from a mysterious cancer within a year of their marriage; Garrett had been prevented from peacefully euthanising her by a malevolent conservative District Court judge. Devastated by the loss of his wife, Garrett began to drink, gamble and abuse prostitutes, largely due to a vicious cycle carrying on through generations of Garrett men. These shortcomings qualified him to become the sheriff of Lincoln County, an area brutally controlled by Swedish immigrant oligarch Nils Badmann. The blue-collar folk of Lincoln County were worked to death with little remuneration on Badmann's ranches and railways, and in his asbestos mines. Their only hero was local renegade Henry McCarty, also known as Billy the Kid, who liberated cattle and loved kittens like only a European Renaissance man could. He may once have shot a woman in El Paso, but this is disputed. Garrett was good friends with Billy, who was a famed drinker and gambler with a similar tortured past. Some say that Pat Garrett had his number all along, but this is ridiculous as telephones were not yet widespread in New Mexico, and Billy the Kid was of no fixed abode. Badmann enjoyed the ear of New Mexico Governor and sadist Huck Waterboarding, who put out a reward for Billy's capture or death. Garrett as sheriff was forced to hunt Billy, and managed to corner the outlaw and his gang indiscriminately planting flowers in a cemetary by moonlight. Billy refused capture, saying there were many other cemeteries in Lincoln County he needed to beautify; Garrett was accordingly forced to shoot him, while sobbing gently. Garrett immediately retired from his position as sheriff, purchasing a ranch and becoming a recluse for many years. After a long battle with alcoholism, he eventually turned his life around with the help of atheist humanist travelling love salesmen. In his early fifties Garrett became an advocate of gun control, abortion rights and beastiality, holding frequent rallies in the small towns of Lincoln and surrounding counties. He was tragically killed at just 58 with a side arm by a crazed drunken traveller, who was probably his illegitimate son or something. 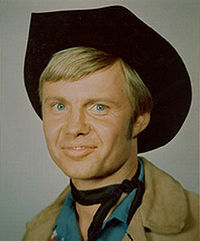 Pat Garrett probably resembled late-60s Jon Voight, which is the incarnation of Voight people are least likely to get mad with. Garrett was raised in a traditional Alabama household by a large, loving family. His father frequently described having spoken with the ghost of George Washington in a dream, where Washington told him that America was a Christian nation, that every boy child should be given a Smith & Wesson on his christening day, and that Newt Gingrich and Rush Limbaugh would be elected Co-presidents in 2012. Desperate to enjoy all the freedoms guaranteed to him by the Constitution of the United States of America, as well as the limitless potential of capitalism under a liberal democracy unencumbered by government intervention and foetus-eating female voters, Garrett left home at 19 and became a legitimate buffalo exterminator under the wise tutelage of W. Farquar Everyman. While at this job, he was somehow tricked by atheist humanist travelling love salesmen into marrying Diabola Mehico, an illegal immigrant with an opium addiction. Fortunately she was struck down by the Lord before the year was out, but not before draining Garrett's funds and introducing him to the evils of opiates. Sheriff Pat Garrett must make twenty two. Pat Garrett followed the gang's trail to a local rancher he suspected of harbouring the fugitives. While sitting in the rancher's house in the fading light, a mysterious figure entered speaking a strange language. Garrett recognised this as the language of Diabola, and shot the man through his chest. Billy the Kid was dead; for good measure, Garrett shot the rancher, burned down his house and detonated explosives causing a mountain to collapse onto the site. This is the source of the greatest of American phrases, "proportionate response". Pat Garrett retired a hero soon after his brave defence of freedom. He married a white Christian woman and made white Christian babies, to help populate the Earth with the image of our Lord and Saviour. In his early fifties he founded the National Rifle Association, the Washington Times and the Lincoln County Get Some Capitalism Association. Aged just 58, Garrett was tragically shot dead on the side of the road by a crazed traveller, who was probably a Mexican or something.